Lockheed Martin Corp. could have done the minimum to clean up a polluted ditch in southeast Akron and fulfill all environmental standards. But the company and its project manager, David Gunnarson, left, were not content to simply replace the soil and toss down grass seed. They turned Haley’s Run into a showcase for urban conservation. 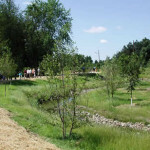 Under the leadership of Gunnarson, Lockheed Martin and its partners restored the PCB-laden channel to a natural, free-flowing stream, installed a scenic walking trail and planted native trees, shrubs and grasses. This beautiful urban greenway is now a true asset for the surrounding low- to moderate income neighborhood and those who work nearby. 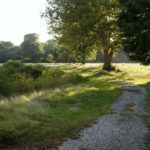 The Land Conservancy hopes to complete a similar transformation at nearby Adam’s Run, which is fed by Haley’s Run. The two projects together could eventually provide a link to the Towpath Trail in downtown Akron. For now, Gunnarson, an environmental engineer, says he is pleased that Haley’s Run has become an asset to the community. Gunnarson says he is proud to have contributed to “the marvelous urban park system in Akron. 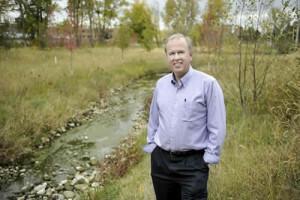 “Haley’s Run is one part of what I see as a great master plan to connect communities and provide access to nature in an urban setting,” he says.